If you are considering building a fence in Northern Virginia, there are a few things you should know. Fences increase property value, keep children and pets safe, improve privacy and security, and can really improve the look of your yard. Think of your home as a portrait and the fence is the picture frame! There are several material, style and color options available. The choices are endless…That’s why it’s best to start with a trusted professional who can guide you through the design and layout options. At Builders Fence Company, we have been assisting our customers for over 15 years. We have an A+ rating with the Better Business Bureau and have won the coveted Angie’s List Super Service Award for three years in a row! Ultimately, homeowners who choose an experienced Northern Virginia fence installer like Builders Fence Company will end up with a better fence at a great value. What’s the purpose of the fence? If you are on a busy street and want to keep your children safe, your fence needs are different than someone who is looking to block out that unsightly neighbor’s yard. What about upkeep? Different materials require different levels of care. We have a wide variety of options to fit everyone’s needs…and budget! Hire a Professional: At Builders Fence Company, we focus on fences – that’s what we do. You won’t find a more experienced fence builder in the area. Make sure to contact us today for a consultation. 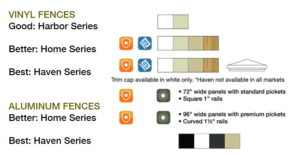 BUILDERS FENCE COMPANY IS NORTHERN VIRGINIA’S EXCLUSIVE ACTIVEYARDS® DEALER. of Active Yards® vinyl and aluminum fencing. We can install your new ActiveYards® fence for you or you can purchase the material from us, and install it yourself. We’ll even provide you a list of all the materials you will need and deliver it to you!